Construction is a business theme designed specifically for construction, building companies and those that offer building services. The theme comes pre-packed with a drag and drop page builder (Visual Composer) to ensure you can easily design your website just how you like it. The layout looks beautiful at any size, be it a laptop screen, iPad, iPhone, Android Mobile or tablets. Plus, Construction includes plenty of customization options that allows you to change the visual style of any elements without touching to single line of codes. 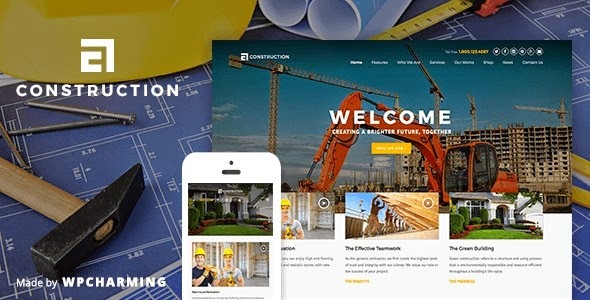 Item Reviewed: Construction Building Business Responsive WP Theme 2015 9 out of 10 based on 10 ratings. 9 user reviews.